Lew Strachman started NovaWake Studios to explore the possibilities of virtual reality, a future he sees going well beyond gaming. 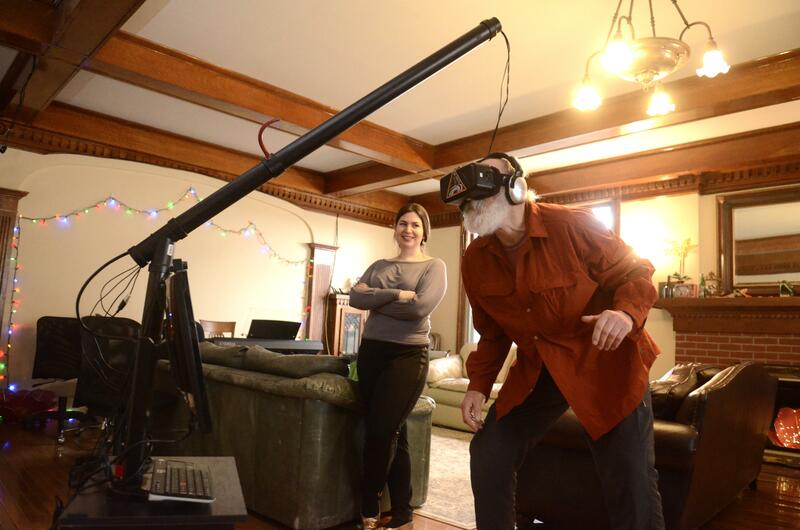 For close to a year, Strachman, and his partner, local game designer Anna Czoski, have been developing virtual reality experiences with a small team who is passionate about the future of the technology. Their work, which has been shown at the River Park Square Mall, the Terrain art space and at the Northwest Museum of Arts and Culture, shows the same experimental bent that is common in a budding market that has attracted industry giants like Sony and Facebook as investors. The team’s newest project, an iteration of an earlier title called “Gravity Compass,” sees players don a headset and earphones that transport them into a massive cave populated by twinkling galaxies. Unlike the version of the game running at Terrain, this latest release allows the user to guide their experience using eye contact, giving the player the sensation of flying as original music plays in time with the flashing of stars. Czoski said the goal of the development team is to create experiences that anyone – including those usually sidelined from traditional gaming experiences – can appreciate. When the team showed off its experiences at the MAC, two quadriplegic visitors were able to step inside NovaWake’s world. Virtual reality has been relegated to the pages of science fiction and the wishlists of the rich in years past. Gaming has already gone through a so-called VR “boom” in the 1990s with releases such as Forte Technologies’ VFX-1 and Nintendo’s Virtual Boy, but neither of those devices took off because of prohibitive costs and an experience that left users uncomfortable or nauseated. Strachman said the team’s goal is to design experiences that are not only fun to play but also pleasant. And that’s not easy. “We are having to invent how you are in virtual reality, how you move through it, how you interact with it,” Strachman said. One of the more difficult obstacles in designing virtual reality experiences is how to make a user’s presence in the created world feel authentic, Czoski said. “I’ve been in some demos, where it’s the simplest thing. You see a giant sphere, and you feel the imposing presence of that object,” she said. The studio’s first game, Nova Asteroids, emulates that feeling by casting the player as a spaceship traveling through space. Users can shoot lasers at asteroids hurtling toward them with movements of the eye, or can duck and contort their bodies out of the way to avoid damage. NovaWake is just one of many studios around the country that have devoted resources to developing for new platforms. Sony, creator of the popular PlayStation home console, plans to release a virtual reality headset compatible with its latest gaming machines at a cost of $399. Oculus, which was bought by Facebook for $2 billion in 2014, released the latest version of its Rift headset on the market earlier this week. HTC plans to release its Vive headset, created in partnership with game developer Valve, next month. While the technology has the potential to create new worlds and realistic scenarios for users to experience, Strachman said, the industry still has a ways to go before emulating the dreams of science fiction. He referenced the holodeck, a device from Gene Roddenberry’s “Star Trek” series that enabled users to learn, entertain themselves and receive medical care in a virtual space. Published: March 30, 2016, 7 p.m.